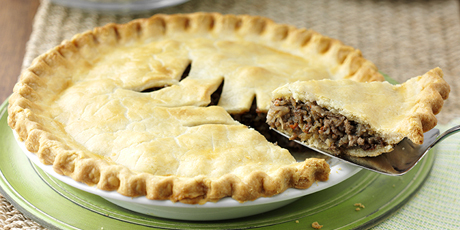 A juicy meat pie with potatoes, carrots and all-spice inside a pastry crust baked to golden-brown perfection.Courtesy of Knorr.Nutritional information per serving size (212 g): 340 calories, 14 g total fat, (4 g saturated fat, 0 g trans fat), 50 mg cholesterol, 670 mg sodium, 34 g carbohydrate, 3 g fibre, 3 g sugars, 18 g protein. % DV: 70% vitamin A, 30% vitamin C, 8% calcium, 15% iron. 1. Preheat oven to 400° F (200° C). Cook meat and vegetables in large nonstick skillet over medium-high heat, stirring to break meat into small pieces, until meat is cooked, about 5 minutes. Add Knorr® Lipton Recipe® Onion Soup Mix, allspice and water. Stir well to dissolve. Cook until liquid is slightly thickened, about 3 minutes. Cool mixture at least 1 hour. 2. Line 9-inch (1 L), deep dish pie plate with 1 crust. Spoon cooled meat and vegetable mixture into crust. Top with second crust; seal edges and cut slits in pastry to allow steam to escape. 3. Bake 45 minutes or until pastry is golden brown. 4. TIP: Serve with creamed corn, beets and sweet potato mash for a complete meal.